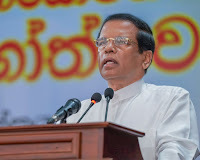 President Mithripala Sirisena admits that even though the elections are fought as different parties, after the victory the service for the community should be provided without party differences. provincial bodies in Polonnaruwa district at the local election held recently. President Sirisena further said that even though some are overwhelmed by victory, the fact is that no party which competed in the last local election could gain a percentage more than 40% out of the total votes. President Sirisena said that the reports show that if this election happened to be a parliamentary election no party could obtain the power to establish a government on its own. When considering the votes polled by SLFP, it is evident that no party could capture power without the assistance of SLFP, he pointed out. Hence, no one should be overwhelmed nor be confused about the results of this election and based on the results of this election SLFP will be brought forward as a victorious political party and would be led towards victory in the future, said the President. President Sirisena further stated he would dedicate to do the needful without any delay as the President of the party. Meanwhile the President stressed the need of the new elected members to act in a decent and proper manner and establish a new ethical political culture, showing the importance of fulfilling responsibilities properly on behalf of people and acting as a decent community that shun consumption of liquor. The oaths were taken by candidates elected to Thamankaduwa Urban Council and Pradesheeya Sabhas of Dimbulagala, Welikanda, Hingurakgoda, Lankapura, Medirigiya, and Elahera. The copy of “Mahatma Gandhi” and the autobiography of Nelson Mandela “Dear Mandela” were presented to the elected members by the President.